Best tour guide we have ever had. Stephanie was great fun and extremely informative. Cannot recommend highly enough. Impossible to be disappointed. It was all quite perfect. This is a great tour guide. She paid attention to what we requested. It was like spending the morning with a good friend - a good friend who knew a lot about her city and had the skill to communicate that knowledge. Outstanding in all aspects! Stephanie was not only superbly knowledgeable, she was a delight to tour with. Expert analysis, great preparation and flexibility delivered a most memorable experience. Reservations made well in-advance provided a smooth and enjoyable full day of exploration. Stephanie also adjusted to our pace and our specific requests with alacrity ... and a smile. When we are back in Bordeaux, Stephanie shall be our "go to" guide once again. Brilliant! My first encounter with Stephanie was on a B&R bicycle trip that started in Bordeaux city. Her knowledge and enthusiasm, especially for Eleanor of Aquitaine, made for an thoroughly entertaining and enlightening experience. I decided to retain her services again when 18 of our friends from St. Thomas USVI were going to be visiting us in Bordeaux. Everyone was delighted with the tour and left with a new found appreciation of this city. She is fantastic and provides a well-balanced experience. Excellent tour guide...Very enthusiastic and well informed..By pacing our walking city tour with frequent stops at places of interest, she has a wealth of historical information. Stephanie was great! 5 star rating. Very personable. Comprehensive and interesting tour. Stephanie was very informative and a delight to spend time with. Our guide Stephanie earned in every way a five star rating. She was charming, very well informed and excellent in every way. We look forward to another tour with her tomorrow. Stephanie was wonderful - I would highly recommend her. We did the St Emillion wine tour. Stephanie communicated in a timely manner and was very interested in what we wanted from the tour and delivered accordingly. She has a comfortable SUV to travel in and in the village, helped us pick local wines to ship back to the US. She is extremely knowledgeable about Bordeaux and the surrounding vineyards. As part of the tour she picked a delightful vineyard for lunch. My wife and I highly recommend Stephanie. Absolutely wonderful tour during a very hot week in Bordeaux. We enjoyed Stephanie's balance of history with modern facts, and especially tips for nearby day trips into the wine country. English or French, as you prefer, made the trip even more comfortable. Stephanie is very easy to converse with, so lunch was a pleasure as well. We can highly recommend her tour. Stephanie did an outstanding job for us. She is very pleasant, communicates well, and is highly knowledgeable about Bordeaux and its history. As she is an American, married to a Frenchman, and who has lived in France and in Bordeaux for many years, she is naturally fluent in English. She will provide you with various insights that you may not get from a guidebook or other guides. I recommend her highly and without reservation. We had a fantastic walking tour with Stephanie. As she is an American who has lived 20 years in France, she has a unique perspective. I recommend her highly. We had an excellent time with Stephanie. Learned a lot, especially about differences between French and American culture. We highly recommend her and Bordeaux. We had first met Stephanie the day before in Bordeaux. We then spent the day with her in St. Emilion. It was a great tour. She's very, very knowledgeable about the region and it's history. We visited a Chateau with a wine tasting and she arranged for a lovely lunch on an outdoor patio. All in all a wonderful day with an A+ guide. We met Stephanie first for a tour of Old Bordeaux with some war history. She lived in Bordeaux for several years and was very knowledgeable. There were four of us and we all thoroughly enjoyed her tour. My husband and I took a tour with Stephanie on our first full day in Bordeaux. It made our whole time in Bordeaux so much more enjoyable! 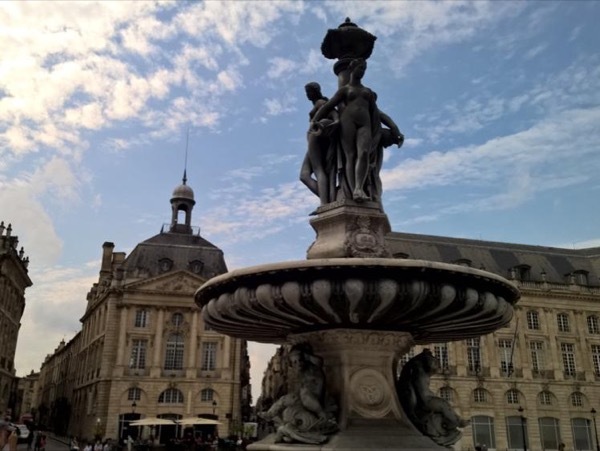 Not only did we get to enjoy some delicious local food, see some sights and learn some history of Bordeaux, Stephanie gave us tips on shopping, what to see, and where to eat. Stephanie is very friendly and very knowledgeable about the local food, the wine and the history of the region. We had a great time with a wonderful guide. Stephanie was outstanding in crafting a personalized tour that met my request that certain sites affiliated with WWI were visited. In addition, she provided a superior walking tour and gave fabulous recommendations on restaurants and shops, focusing on the city's gems and ignoring the tourist traps. Her English and French are impeccable. You couldn't do any better than Stephanie as your guide. We just completed 2 days of tours in Bordeaux and St. Emillion with Stephanie. She is wonderful. After 5 minutes we were "lifelong"friends. She knew exactly what we wanted to do. We saw very interesting sites, Stephanie knew some very interesting stories. On a scale of 1-5 I would rate Stephanie a "10". She was so friendly and knowledgeable. We thoroughly recommend Stephanie! We had an excellent day with Stephanie! Her knowledge of French culture and ability to compare and contrast it with American culture was fascinating. She showed us many of the "hidden gems" of Bordeaux that we could never have found on our own. This tour was the highlight of our week in France and one of the best we've had on any trip. She also stayed on schedule and had the perfect mix of active and more restful time on the tour, as we had requested. TOUR GUIDE RESPONSE: Thank you for the kind words. It was so nice meeting you and your family and I hope you will come back one day for a glass of Chateau La Dominique at the Terrace Rouge. We couldn't have asked for a more perfect guide since Stephanie grew up in the US, married a Frenchman and has chosen to raise her children in Bordeaux. She is warm and spirited, speaks French like a native, is encyclopedic in her knowledge of Bordeaux and it's history, and can speak to the similarities and differences between French and American life, attitudes, politics, etc. She packed more into a day than could be imagined and we came away with a great appreciation of the region and its people. 5 Stars is not high enough for the amazing tour of Bordeaux and wine tasting given to us by Stephanie. It was our first day of a 2 week vacation in France that included Bordeaux, Nice and Paris and Stephanie set a high bar of quality and expectation that the rest of the trip was compared. And while it was all amazing, none met the level of Stephanie! The best tour of this entire trip which is saying a lot among all the great guides we had. Stephanie is an American but has spent many years living in France. She knows the shops, the sights and the restaurants. Thank you for a fabulous day! TOUR GUIDE RESPONSE: Thanks Nancy :) I had a fabulous day with you and Clarence today and I truly hope we will see each other again <3 Bon voyage!! Stephanie is a remarkable tour guide! She is personable and bright, and thoroughly understands the history and culture of her city, as well as the food and wine of the entire region. Most importantly, she made us feel like we were visiting a friend and not simply tourists. The day we spent with her was one of the highlights of our entire vacation. Stephanie was just fantastic. She spent the entire afternoon with us. We learned the history of the city and region as we visited all the highlights.. She never rushed us, treated us to coffee/pastry. Perhaps best of all was getting an "inside" look at the culture and mindset of the French people from the point of view of an American. We made a new friend today! TOUR GUIDE RESPONSE: I feel exactly the same way! Enjoy your amazing day in the Medoc today and let me know the next time you are i n Bordeaux! Stephanie is incredibly knowledgeable about the country and its history. The fact that she is an American means that her English is impeccable plus she has insight as to the questions American visitors may have. We spent 4 hours seeing Bordeaux and hearing its history. LOVED it!!! We were four adults on a short trip to Bordeaux and booked Stephanie to show us around. She was absolutely fantastic and was able to adapt her tour to suit our requirements. The tour lasted three hours including a delicious coffee and pastry break. The time flew by. Can't recommend her highly enough. Stephanie was tremendous. She was extremely knowledgeable and thorough. As an American now living in France, she gave us insights into the French people and culture from an American perspective. I would rate her a 10 on a scale of 10. This was a reunion tour for us as Stephanie was our fabulous guide 2 yrs ago And again, she was wonderful. She walked us around the city giving historic and cultural perspective. She's the type of guide you feel is like an old friend. I highly recommend her when in Bordeaux for any trip you want to take; I'm confident you will be thrilled! Stephanie was a 10. She was enthusiastic, knowledgeable and entertaining. We had a wonderful 3 hour walking tour mingling with locals, learning the history & enjoying the cuisine. Very knowledgeable and pleasant guide. Well organized, but flexible to meet personal priorities. TOUR GUIDE RESPONSE: It was great to meet you and Cindy. I only wish you had arrived earlier so we could have visited the farmer's market. Happy travels to you both! Stephanie was an absolutely wonderful guide. She is knowledgeable about history, architecture, wine, food and local customs. Stephanie's tour allowed us to later feel at ease in navigating Bordeaux on our own despite our lack of French language skills! I highly recommend using Stephanie as a guide. Perfect tour; couldn't have asked Stephanie to do more! Definitely would recommend her to give a tour of Bordeaux. We cannot imagine there is anything she doesn't know about the Bordeaux city center and its colorful history! She is very informative, outgoing, energetic and enthusiastic about all that there is to love about Bordeaux & how it has changed over time. She is an American so obviously her English is excellent, but is married to a Frenchman so her French is very good, too. TOUR GUIDE RESPONSE: Thanks Teri :) That is very kind of you to say. I hope you enjoyed the rest of your stay and tell everyone back home to come to Bordeaux! We were 10 minutes late arriving in Bordeaux due to traffic, and it was raining! But that didn't matter as Stephanie has the sort of personality to drive the clouds away - and she did! Consequently we had a fantastic 3 hour tour of Bordeaux. Being our first time there didn't matter as Stephanie made us all feel quite at home, and answered any questions we put to her, including helping us to find somewhere nice for lunch. We loved Bordeaux and she helped to make it a place we want to return to again. A great weekend in Bordeaux. Stephanie was the best. I wished all guides were this good. She sets the bar high. Absolutely, the best tour guide we have ever had. She is so knowledgeable and her French - English translation is perfect. It's easy to rate Stephanie a full 5 stars. Very interesting and informative tour of the Historic area of Bordeaux. Would highly recommend ! Wonderful and informative tour of Saint Emillion and area. Stephanie guided our 4-hr walking tour ("Bordeaux Highlights"). This American expat has lived in Bordeaux for about 10 years & is extremely knowledgeable regarding the history & culture of Bordeaux. She changed the tour time to conform better to our interests & extended the time to include lunch at a great sidewalk café so we could soak up the city rather than race around to fit everything in. She is very personable & a lot of fun. A GREAT guide whom we would highly recommend for this half day tour. Stephanie gave us a fantastic tour, geared to our particular interests. She is very flexible and knowledgable and helpful with where to buy certain things and which are the best restaurants and wine bars. I have no hesitation in recommending a tour with Stephanie. Merci bien, Stephanie! Stephanie is absolutely superb. Very knowledgeable, utterly charming, and pitch perfect. We'll be back for more. Stephanie exceeded every one of our expectations. She was extremely well informed, knowledgeable, gracious, patient and charming. We can't recommend her highly enough. Tours by Locals is a great way to find a guide. Our guide in Bordeaux, Stephanie, was absolutely fantastic. Our group (of 4) voted her the best guide we had on the entire 3 week trip. We can't say enough great things about her! Stephanie is a fantastic guide. She is knowledgeable, and informative. She is able to customize tours to meet the interest of the group. Our tours with her (Bordeaux and St Emilion) were fun and the pace was perfect. She made lunch reservations each day that were wonderful. She does a very good job of sharing what life is like living in Bordeaux. Finally she arranged for wine and other shopping that we were interested in. We strongly recommend her as she is excellent. Stephanie was a superb tour guide. Very knowledgeable, thorough, patient, warm and caring. She showed us around Bordeaux for two days, and was able to answer just about any question our group of travelers posed. She showed us some lesser-known sights, and all with great warmth and enthusiasm. She spoke clearly and not overboard on dates and details. No one lost interest. We would have loved to have stayed with her for several more days, and consider ourselves lucky to have found her. Stephanie was absolutely charming!!!! We enjoyed our tour with her completely. She was gracious, friendly, intelligent and made everything very interesting. She had a great knowledge of the history of France and Bordeaux in particular. She was extremely aware of what we would like and accommodated us completely. We would highly recommend a tour with her. The best complements to Stephanie. Outstanding service. We met her at the airport, took us to St Emilion, and then to Bordeaux. very professional and a perfect companion. If I could go higher than five stars, I would! We just completed a wine bar tour with Stephanie, but it was so much more. She has extensive knowledge about not only wines, but also the history, architecture and customs of Bordeaux and France, in general. She also gave us a lot of information on what else to do while visiting Bordeaux. Stephanie was very personable and we felt right at home with her immediately. If you have a chance to book any of Stephanie's tours, don't pass it up. Stephanie is an outstanding guide. I highly recommend her. She is incredibly knowledgeable and also very warm and caring. Within the two days of our tour, we began to think of her more as a friend than as a guide. My daughter and I thoroughly enjoyed our 2-day customized tour. Stephanie designed a plan that included all of our desired activities, plus a few surprises that we would not have known about. She did a wonderful job of choosing restaurants and activities that suited us perfectly. Thank you! Fantastic tour from Bordeaux to St Emilion. Stephanie is an outstanding guide although by the end of her day, she felt more like an old friend. She was exceptionally knowledgeable and conveyed the information in a friendly manner. She was flexible to our needs and/or last minute requests. She imparts her knowledge with her background to give you a more personal concept of the area. I would give Stephanie my highest recommendation and have already given her card to someone I met in Bordeaux today. Stephanie was amazing! I had some very special requests which she carried out well beyond the call of duty. Not to mention her astounding knowledge of Bordeaux and it's fascinating history. She took me to the best lunch place ever as well! I would hire her again before going to anybody else in the area. I whole heartedly recommend her to anybody looking to tour Bordeaux. This experience was amazing! Stephanie puts all her passion into showing you the local history and culture. She was always concerned to give me the best overview of Bordeaux... we tasted wines, traditional food, visited different shops but, above all, we shared moments and experiences that showed me Bordeaux through a different angle (and how good it felt!). We couldn't visit the Wine school, however I went there afterwards and it's a place that no one should miss! Thanks Stepahnie... I felt welcomed! TOUR GUIDE RESPONSE: Thank you :) I too was sorry the Maison du Vin was closed during our time together, but I am so glad you went back later. I look forward to visiting your wine bar in Porto one day very soon! I have left Bordeaux with a wonderful rich understanding of the city, the Bordelaise, the history of the area, and how people live,and enjoy their Saturdays! We had coffee in one of the large squares, toured the artisanal shops, walked the quay along the river, ate lunch; all the while winding in and out of the wonderful architecture. Stephanie's intelligent comprehensive understanding of the city combined with her vivacious personality made the whole tour a fabulous experience! One of the best tour guides we've experienced. Wonderful historian and most enthusiastic. English and French superb. A most enjoyable experience. We couldn't have asked for a better experience. Stephanie planned our day in Bordeaux perfectly -- the right balance of history, culture, tasty food and local flair. It was particularly nice to get an expat's perspective on the French lifestyle. We highly recommend her for anyone visiting the area. We couldn't have asked for a better experience. Stephanie planned our day in St. Emilion perfectly and was very flexible with our ever changing cruise itinerary. We highly recommend her for anyone visiting the area. Stephanie is terrific. Even though we had limited time to sight see, we really got in everything we could possibly want on our first trip, and learned so much.She is very knowledgeable about the history of the area and a great resource for hotels, restaurants, and attractions. All was very well organized and also very flexible: while my husband and I took to keep our kids (14 and 11 years old) occupied, Stephanie them to try amazing chocolates. We fell in love with Bordeaux thanks to Stephanie. We had a wonderful day with Stephanie in Bordeaux. Her knowledge of French history and culture was impressive. We toured the city walking and riding the tram and enjoyed a break at a café for coffee and the most wonderful pastries we have ever eaten. Stephanie was warm and friendly, flexible to our needs and I would not hesitate to recommend her tour guide services. Bravo!